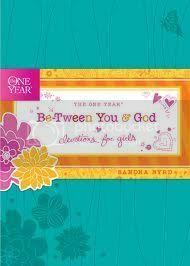 This review is months overdue, but that is because my daughter has actually been and still is using The One Year Be-Tween You & God Devotional for Girls by Sandra Byrd. I had become discouraged about reviewing devotionals for tween girls until I found this one, which I can highly recommend. In the mornings, we have done it together and she has done it independently...without being reminded most of the time. I even caught her reading through it in the afternoons. First let me judge this book by its teal, leather cover with impressed flowers and butterflies that my daughter found so pretty and I found so functional. It has a journal-like quality, being under 7½ x 5½ in size, making it rather convenient to carry along. It also has a gold ribbon bookmarker that keeps her place quite nicely. I was at first disappointed that the book was not in pink, previously my daughter's favorite color, but lately she has been liking teal, so she was thrilled. Inside is not colorful, but not boring either; the pages have a girl-appeal, journal-like quality with decorative sections. A tab layered in flowers at the top with a date and beside it a note in a clean handwriting font with a question addressed to God, common and relevant to many pre-teen girls generally and specifically. Although the more specific might not be relevant to the child that day, the body of the message is still beneficial. Dear God, I'm afraid my grades will start to fall if I get one bad grade on a test, even though I'm usually a good student. Dear God, One of my friends gets mad if I "dare" to have another friend. I hung out with other friends, but I don't tell her. I feel dishonest. What should I do? Dear God, I'm only a kid, really. What can I do to tell others about you? I'm afraid if I speak up, people will laugh at me. The body of the page starts with: Consider this..." It is not preachy, but helps lead the child into a deeper thinking and change of perspective as a good devotional should. The advice given is gentle but firm, Biblical, and quite age-appropriate, like something a grandparent might say. At the bottom of each page is another note-like section that begins with "God says..." with a scripture. Next to it is "How About You?" with one or more questions to make it even more relevant and help the child to put what was learned into practical use. The one thing it lacked is a reminder to pray at the end of the pages. Personally, as an adult, I find such reminders in my devotionals annoyingly unnecessary, particularly when it is written about for what I should pray as if the devotional itself was not adequate to prompt a person on its own. However, considering the target age, I think a reminder to talk with God at the bottom of the page might have been beneficial for the girls who would be doing this devotional independently. So, I would suggest to parents, to begin with the child guiding her through the devotional time process ending with a time for prayer, until the child seems prepared to take the initiative to spend this precious time independently with God guided with devotional. I received a complementary copy of this book from Tyndale House Publishers for my honest review.